When you hear someone say "Once in a Blue Moon…" you know what he or she means: Rare. Seldom. Maybe even absurd. After all, when was the last time you saw the moon turn blue? Step outside at sunset on Thursday, May 31, 2007 at 9:04 p.m. Eastern Daylight Time (6:04 p.m. Pacific Daylight Time, 8:04 my time), because there's going to be a Blue Moon for North Americans this month. But for those living in Europe, Africa, Asia and Australia, that same full Moon occurs after midnight, on the calendar date of June 1. So in these regions of world, this will not be second of two full Moons in May, but the first of two full Moons in June. So, if (for example) you live in Philippines, you'll have to wait until June 30 to declare that the Moon is "officially" blue. Soot and ash particles, deposited high in the Earth's atmosphere can sometimes make the Moon appear bluish. Smoke from widespread forest fire activity in western Canada and created a blue Moon across eastern North America in late September 1950 and Sweden in 1951. The eruption of Indonesian volcano Krakatoa in 1883 caused the moon to appear blue for nearly two years. Ash and dust clouds thrown into the atmosphere by fires and storms usually contain a mixture of particles with a wide range of sizes. Most are smaller than 1 micron, and they tend to scatter blue light. This kind of cloud makes the Moon turn red; indeed, red Blue Moons are far more common than blue Blue Moons. But some of the ash-clouds were filled with particles about 1 micron (one millionth of a meter) wide--the right size to strongly scatter red light (0.7 micron)--, and no other sizes present, while allowing other colors to pass. White moonbeams shining through the clouds emerged blue, and sometimes green. The ash caused "such vivid red sunsets that fire engines were called out in New York. This is rare, but volcanoes sometimes spit out such clouds, as do forest fires. In the aftermath of the massive eruption of Mount Pinatubo in the Philippines in June 1991 there were reports of blue moons (and even blue Suns, and noctilucent clouds) worldwide. 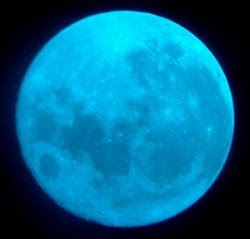 Calendar blue moons occur infrequently, and the saying once in a blue moon is used to describe a rare event. However, they are inevitable because of the mis-match between the solar and lunar cycles. Each calendar year contains 12 full lunar cycles, plus about 11 days to spare. The extra days accumulate, so that while most years contain 12 full moons to match the 12 months, every 2 or 3 years there is a year with 13 full moons. On average, this happens once every 2.72 years. The average interval between Full Moons is about 29.5 days, whilst the length of an average month is roughly 30.5 days. This makes it very unlikely that any given month will contain two Full Moons, though it does sometimes happen. On average, there will be 41 months that have two Full Moons in every century, so you could say that once in a Blue Moon actually means once every two-and-a-half years. The rule might have evolved out of the fact that the word "belewe" came from the Old English, ("Yf they say the mone is belewe / We must beleve that it is true" [If they say the moon is blue, we must believe that it is true]), meaning, "to betray." "Perhaps," one suggested, "the second full Moon is 'belewe' because it betrays the usual perception of one full moon per month." In the 19th century, the phrase until a blue moon developed, meaning "never." The phrase, once in a blue moon today has come to mean "every now and then" or "rarely"—whether it gained that meaning through association with the lunar event remains uncertain. Absurd? Yes, but that's what a Blue Moon is all about. Step outside at sunset on May 31st, look east, and see for yourself.. Above: One way to make a blue moon: use a blue filter. That's what Kostian Iftica did on July 2nd when he photographed this full moon rising over Brighton, Mass. Excerpts from different researches :-). Wow i would love to see blue moon! Actually i'ved never seen blue moon eversince in my life!Thank you for the information Lots,i would definitely wait for that night to see it in my own naked eyes,hehehehe.I would probably take a picture of it if it's possible. Anyway,Happy memorial day & godbless Lots!